I recently had a chance to review the new SnoreRx which has now replaced the original version after it was criticized for its incredibly large size. 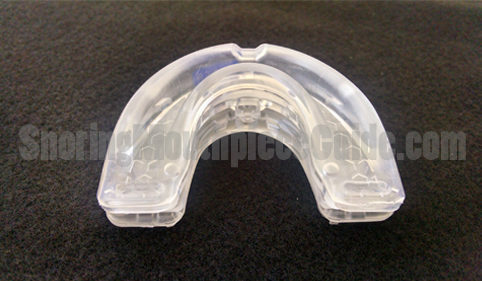 The redesigned version addresses the issue of being too bulky by reducing the overall size of the mouthpiece, especially in the molar area. 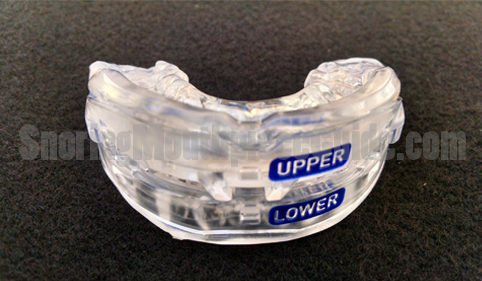 After making improvements to the original design, the manufacturer now claims to be the undisputed best-in-class stop snoring mouthpiece. Does it really stand up to these claims? I put the new SnoreRx to the test and documented the results along the way. Fill a mug with boiling hot water. Carefully drop the device in and allow to rest for 90 seconds. Remove the SnoreRx using a pair of tongs and give it a quick dip into a mug filled with cold water for 2-3 seconds. 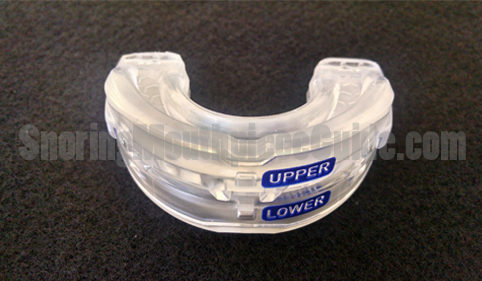 Open wide and place the entire unit into your mouth with the “UPPER” marking facing up. Bite down and hold for 30 seconds. 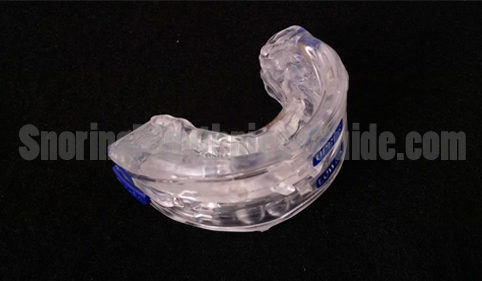 Remove the mouthguard and immediately drop it into cold water. Leave for 60 seconds. I found the fitting process to be rather simple, taking less than 5 minutes total. I was able to achieve a close fit on my first attempt. The instructions state that you can try up to 3 times if you don’t have success the first time. Keep in mind that heating and cooling the device more than 3 times can weaken the material and render it useless. Immediately after taking the impression I adjusted the setting to 5 mm before trying it out the first night. I’ve been working the overnight shift lately so this gave my wife the perfect opportunity to observe my snoring habits. While asleep she checked in throughout the first night (her day) and did not hear a single sound. Instant success! Upon rising, I noticed a bit of tenderness in my jaw from being stretched overnight. Before going to bed the following night, I reduced the advancement by 1 mm to 4 mm. This position felt more natural and comfortable. After another night of heavy sleeping, my wife reported absolutely no snoring sounds coming from the bedroom. In the morning my jaw was no longer tender and the snoring was gone. I decided to test the device for an additional 6 nights and had experienced success night after night. Overall it was incredibly effective and comfortable to wear. The SnoreRx is a MAD that actually allows advancement adjustment. Most devices move the jaw forward to a position that may or may not be comfortable or effective. This device allows forward adjustments up to 10mm which is nearly 1/2″. The manufacturer recommends that you begin using the device in the 4mm-5mm setting range before making any adjustments for a more comfortable fit. In addition to the incremental forward adjustments feature, you are also able to create a custom mold that conforms to the shape of your teeth. The SnoreRx offers similar boil and bite technology commonly found with other oral appliances. Simply drop the device in boiling water for 60 seconds, remove and cool slightly then take an impression of the teeth by biting down. Have a bowl of ice water handy to drop it in once formed. 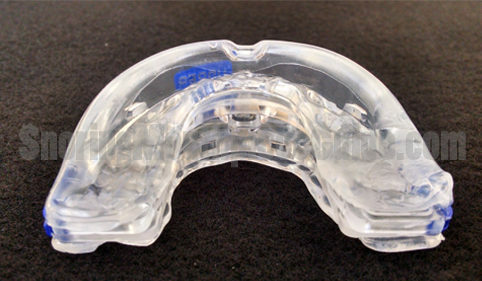 The newer SnoreRx features a thin inner frame that is both rigid and durable. The unique frame allows you to make small incremental tray adjustments by “ratcheting” it forward and back. Longevity is also a selling feature that several companies rarely talk about. This product is created from a medical-grade copolymer, making it both durable and long lasting. They claim that one should expect for it to last anywhere from 12 to 15 months. Several similar products last less than a year and often only 4-6 months. Since some non-prescription MAD’s are relatively expensive, this is an important factor that one should take into consideration. Expect to pay a bit more for a product that offers so many features. The SnoreRx currently retails for $99.00 plus $6.95 for standard United States Postal Service shipping. Overall cost shipped to your door comes to around $106.00. One consideration that should be examined when shopping around for a MAD is whether or not it’s FDA cleared and BPA free. 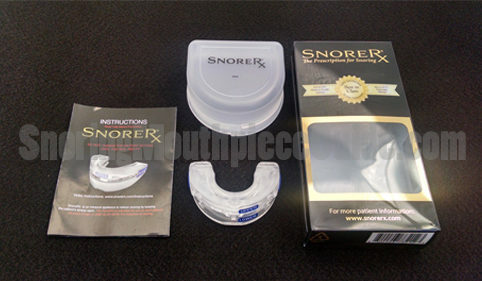 Devices such as the SnoreRx are regulated by the Food and Drug Administration as a class II medical device. 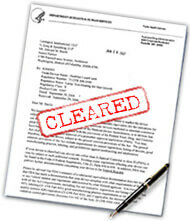 Prior to selling any such device, a manufacturer is required to obtain this FDA clearance. In doing so, the government is ensuring consumer safety. Keep in mind, not all products that are being sold in the United States are FDA cleared. 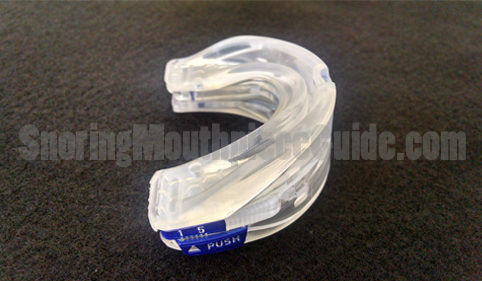 Also, some mouthpieces (often less expensive) may contain a controversial harmful toxic chemical known as BPA. The manufacturer of the SnoreRx claims that their product is both FDA cleared and BPA free. After checking the FDA database, I was able to confirm that it was cleared in Nov 2011 and is currently registered. An overwhelming majority of people who have tried this product agree that it is comfortable and easy to use. 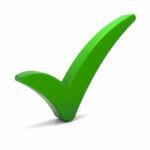 Most experience immediate results and are happy with their purchase. On the other hand, there are some complains that have also surfaced online. 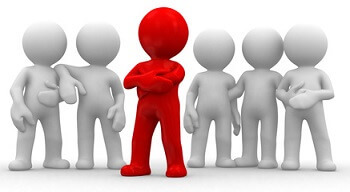 The most common complaint has to do with shipping and billing. In older online reviews predating 2015, some individuals with smaller mouths found it to be too large and difficult to keep in their mouth overnight although this complaint seems to have been resolved with the latest updated version that was released in 2015. Others have reported oral discomfort for the first 2-5 days of use. This is typical of most devices and should eventually disappear. Should I buy SnoreRx or try something else? 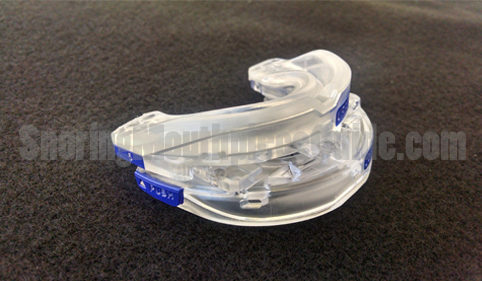 There is no doubt that this stop snoring device is well designed and functional but does this mean you should hand over the $106.00 and give it a try? 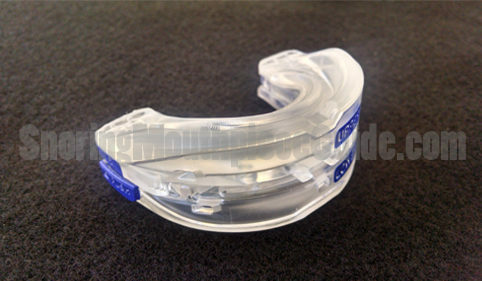 The SnoreRx is one of the few MAD’s available without a prescription which allows you to adjust the position of your lower jaw. This combined with the custom boil and bite feature allows for a better fit when compared to other products on the market. Its design mimics oral appliances that are available from a dentist with a prescription. Most MAD’s that are prescribed are used to treat obstructive sleep apnea and should not be confused with this product and other OTC stops snoring products. 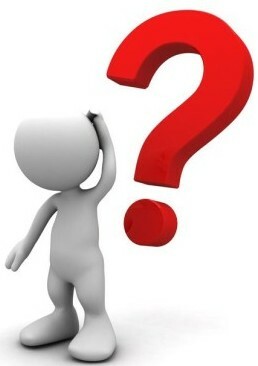 As for the inventor and his credentials, there is very little information available. 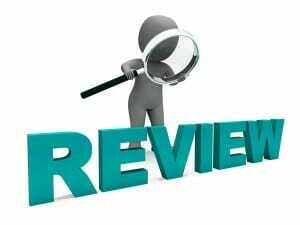 There are however several medical professionals who support this product which gives it credibility. 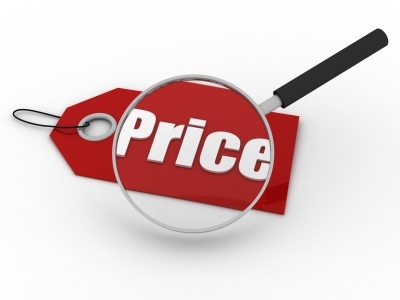 The price appears to be fair considering the complexity of its construction and its ability to last for a long time in comparison to other MAD’s that are available. I was very impressed with the quality and the ease of use. It’s the only custom molded MAD on the market that can be adjusted over and over with no tools required. It’s well constructed and should easily last the 12-15 months as recommended by the manufacturer. After closely examining the SnoreRx myself and then comparing this information to what actual customers are saying, The SnoreRx receives my approval on the basis of comfort, adjustability, and durability.